Our first podcast was in the Fall of 2005. Now over 500 Episodes Later, we're more dedicated than ever. You can help support our independent online publishing in a few ways. Patreon is the easiest way to support The Digital Story, The Nimble Photographer, and theAnalogstory, all with just one click of a button, and for as little as $5 a month. Visit our page at patreon.com/thedigitalstory and click on Become a Patron. It's that easy. And as a thank you for your support, you will have access to the exclusive The Nimble Photographer Podcast - Season 1. These shows will be available only to Patreon members in 2016. We think you will enjoy them. 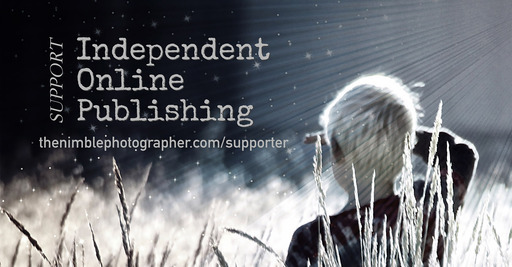 As an individual who believes in small business publishing, you can contribute by Becoming an Independent Online Supporter. The Digital Story, The Nimble Photographer, and theAnalogstory are solely owned and operated by Derrick Story. This is his day job. Contributing only takes a minute, but helps provide toward a year's worth of content, not only for the current publishing, but to bring to life the new ideas in the hopper. Sponsors of the weekly podcast receive much more than the typical canned ad spots. The Digital Story gets behind its sponsors and explains to listeners the benefits and uniqueness of their product or service. Sponsorship includes informative story spots on the podcast, ad tiles on the TheDigitalStory.com, and short blurbs on social media sites. Our goal is to do this in a way that does not alienate the listener. Product mentions contain useful information. They are published in the second half of the show so the audience first hears the top stories of the week, not ad placements. And we feature sponsors who have products and services that we believe are interesting and helpful to our audience. Sponsors can sign up for a single show, but we recommend a bundle of four that includes a discount. You can learn more about becoming a sponsor by writing Derrick at: derrick@thedigitalstory.com. By becoming a supporter of The Nimble Photographer, The Digital Story, and theAnalogstory, you're helping to ensure the steady flow of quality content. Our endeavor is independent, honest, and focused on the enjoyment of photography and storytelling. We ask that you renew your support each year, and we thank you for your faith in our efforts.